This paintballing hen party is bound to get your hen group stuck in shooting, laughing and creating some friendly competition on your hen party. 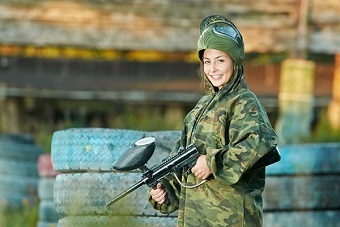 If you’re looking for a different hen party activity from the rest, paintballingwill definitely be right up your street. A Nottingham hen party idea is perfect for something different in the stunning Sherwood Forests and old style city centre. You have the choice of either a half or full day of paintballing, and as many paintballs as your heart desires after the 400 we’ll give you, so you can either have a relaxed day of learning the ropes or go crazy and battle to victory over several acres of forest and obstacles! Everything you need is provided for you including all the equipment and the up to date paintballing guns, making this activity completely stress free. A professional instructor will take you through a safety brief and let your whole hen group master the guns with a bit of practice time. Then the fun begins with a huge variety of fun games that are tailored to your hen group and what kind of day you want. The Nottingham course is full of different obstacles and hiding spots so you can really get involved and try your best to dodge and shoot your way to victory! With this paintballing activity in Nottingham, you’ll also be provided with a hot lunch and hot drinks after you’re finished with the fun, which you can enjoy in the scenic forest of this city. The lunch will be enough to fill you and your hen group up for whatever you’re doing after whether that be a big night out or quiet girls night, and is suitable for vegetarians. If you’re looking for an active and exciting hen party activity, look no further than this Nottingham paintballing hen party! Call us on 0161 341 0052 and let our events planners do all the organising and work, so all you have to worry about is making some memories on your hen party!